The SightScope NearView is simple to prescribe and fit! 4. 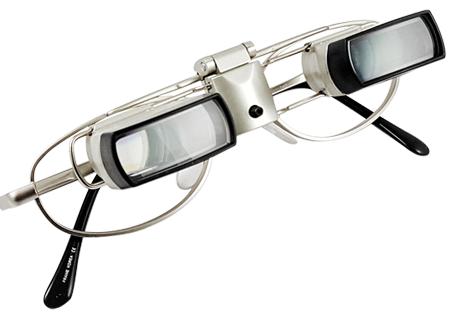 Choose the Ocutech Sleek eyeglass frame in either the small (50mm eye-size) or large version (53mm eye-size), available in silver and gunmetal colors. 5. When positioning on the patient, adjust nosepads and slide each telescope right or left to center the each pupil within the telescope. 6. Then separate each telescope slightly to maximize the field of view. 7. Rotate the line of sight adjustment screw with the Allen wrench to align the optics with the line of sight of the user.